One Direction has done the almost impossible for a boy band: The English-Irish quintet has held the fickle attentions of teenage girls the world over for three years— the equivalent of 30 in tween years— and the band's new album, "Four," isn't likely to diminish the group's stronghold. On "Four," One Direction— Niall Horan, Zayn Malik, Liam Payne, Harry Styles, Louis Tomlinson— continues to produce perfectly polished pop tunes with the edges buffed for maximum shine. And shine they do: it's hard to deny the anodyne appeal of strummer "Ready To Run," the up-tempo Buddy Holly-sway of "Girl Almighty," the Ed Sheeran-penned sweetly nostalgic "18," or new single, "Night Changes," which may or may not be about losing one's innocence. It's hard to tell since the band's lyrics wisely never veer from PG. Produced primarily by Julian Bunetta and John Ryan, musically, "Four" often harks back to the '80s, a decade before any of the band members were born, with open, echo-y drums that wouldn't sound out of place on a Martika record. Acoustic guitars and synthesizers comfortably collide throughout. One Direction's primary appeal is its members' vulnerability. When they aren't riding in on their white steeds to rescue the girl, they are willing victims of love, seemingly powerless over femme fatales on songs like peppy "No Control" and "Stockholm Syndrome." In a capricious world, they promise undying fealty and they will never knowingly hurt you, or if they do, they are relentlessly apologetic, such as on "Where Do Broken Hearts Go." They are as mythical and non-threatening as unicorns, and that's why teenage girls find them so fetching. One Direction's last album, "Midnight Memories," was the world's best-selling album of 2013. 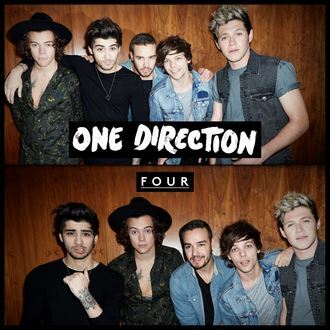 "Four" will likely give Taylor Swift's "1989" a run for its money for the 2014 title.